OVO has unveiled a range of electric vehicle and energy management products, including what it claims is the world’s first domestic and widely available vehicle-to-grid charger. 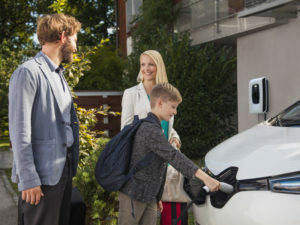 The charger has been revealed as a part of a range of products under the energy supplier’s new VCharge scalable platform that also includes a new smart charger and a battery storage solution. The V2G charger has been launched to help manage the distribution of electricity and has been designed in and will be manufactured in the UK. The charger enables drivers to sell surplus energy from their electric vehicle batteries back to the electricity grid, which OVO says may have the potential to mean EV drivers may never have to pay to be on the road again. OVO CEO and Founder Stephen Fitzpatrick said: “We’re helping to solve one of the biggest challenges facing the energy sector. We’re enabling thousands of EV batteries to help balance the grid in times of peak demand, more renewable energy to come onto the system, and households to reduce their electricity bills. The company further presented a new smart charger, which will enable electric vehicles to be charged during off-peak hours, thereby easing pressure on the electricity grid as well as allowing drivers to take advantage of cheaper off-peak electricity. In addition, a Home Energy Storage solution offers households battery storage to dynamically and proactively manage energy and power use.